Would you recommend Homescreen to a friend? @thomasmeagher this seems identical to that. I get the attraction to this data, but I'm not sure why there was a need to recreate this...? @chrismessina @thomasmeagher We didn't want the data/sharing to be constrained inside a single app, so we built ours in a way that was a bit more public and leveraged the existing Twitter graph. We're also working on some other features that build on this design choice, so stay tuned! @MattHartman Cool! Does placement on the /top-apps page represent rank? (i.e. top left is number 1) Would be cool to filter by device too. @thomasmeagher yes, that's how it orders the top apps. the ones in the dock are the most popular dock apps. agree it would be great to filter by device! Saw all the great guys working on this during the summer while I was at Betaworks. Glad to finally see everything working! @stttories thanks for the feedback! We're constantly tweaking the image detection algorithm. In the lower right of the app (share icon) there's also a choice to "confirm app detection" which will let you untag a misidentified app. Love the simplicity, @MattHartman. Here's mine: Your turn to analyze my psyche, @shaanvp. @rrhoover you have some news to listen to, I'd say. @rrhoover @shaanvp looks like you have a couple emails in your inbox :) Here's mine http://homescreen.is/matthartman. Newest app for me is the Economist Espresso app. I downloaded it after seeing it on @borthwick's homescreen this morning (http://homescreen.is/borthwick). @rrhoover How do you even live with all of those bubbles? At some point if there ever isn't a time without waiting notifications, aren't the bubbles unnecessarily stressful? 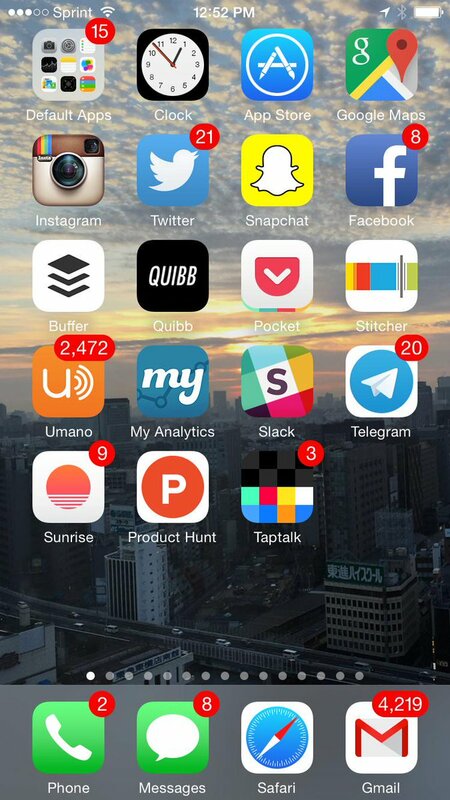 Share your homescreen and discover new apps.